The majority of drivers who use component car speakers choose them because they deliver the best sound quality that can be achieved by a car stereo. The main reason behind the excellent performance of components is that they come with speakers and tweeters of different sizes separated. It’s upon you to decide where to fix each component so that the overall performance of the system is as impressive as you would want. 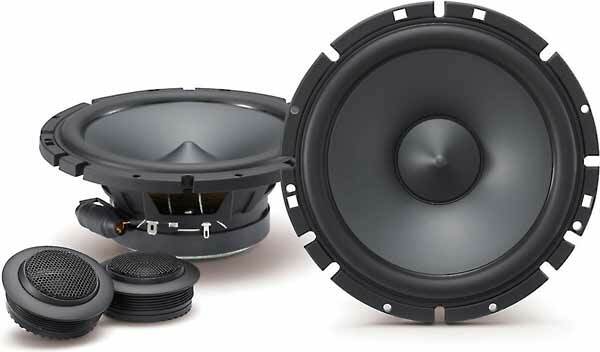 The demand for component car speakers is on the rise and manufacturers are continually supplying components with varying features and specs. Understanding how these features affect your choice of speaker goes a long way in helping you choose the right one for your car. For every speaker, its power handling capability is indicated by RMS Power and Peak Power (or MAX). These measurements help you to know how much power the speaker in consideration can handle. RMS Power rating is the more important rating to consider as it measures the amount of power a speaker can handle continuously. Peak Power rating indicates the amount of power the speaker handles in short bursts. As you look at power handling rating, have your car’s system in mind. If the car has a low-powered system (such as 2 – 50 watts RMS), you don’t need component car speakers that can handle lots of power. On the contrary, a high-powered system with powerful amplifiers needs component car speakers with a high RMS rating. A rating that is close to the amps’ output is the best choice. This rating shows how much volume the speaker can give with a specific amount of power. In other words, it informs of how 'efficient' the speaker is in using the provided power to produce sound. At a given wattage, a speaker with a higher sensitivity rating is louder than a speaker with a lower rating. Low-powered car sound systems (15 watts RMS per channel or less) should be coupled with component speakers with a high sensitivity rating (90 dB and above). For high-powered systems (16 watts RMS and above), speakers with low sensitivity rating provide great sound quality. The frequency range of a speaker indicates the lowest and highest frequencies at which it can emit sound. For example, a frequency range of 20 Hz – 22,000 Hz tells you that 20 Hz is the lowest bass output (the lower the number is, the deeper the bass), and 22,000 Hz is the highest frequency or the highest treble. Frequencies between 20 Hz and 22,000 Hz are considered safe for the human ear. If you don’t want to buy a subwoofer but still enjoy a deep bass, consider component speakers with frequencies reaching 50 Hz and below. A speaker’s impedance indicates its resistance/opposition to the flow of current. When comparing component car speakers, the speaker with a lower impedance rating allows more current to flow and the one with a higher rating allows a lesser amount of current to flow. Low current flow means the amplifier needs to push more to get current through the system. This has one downside - the amp may not always be able to do so and may get overheating and damaged frequently. On the other hand, higher impedance yields low volume because the amount of current flowing through the system is reduced. What is the optimum impedance? Your speaker of choice should neither have a low nor a high impedance rating. The recommended rating is 6-8 ohms, the impedance at which the speakers can produce enjoyable sound and the amplifier stands at a low risk of damage. There is a wide variety of materials used to make different parts of car speakers. The material used determines the speaker’s responsiveness, quality and durability. Stiffer and more lightweight materials are generally preferred and one of the most common materials used on woofers is polypropylene. Other materials used include woven fabrics (like Kevlar), aluminum, and titanium. The woofer surround of a high-quality speaker should have a highly-durable, free-moving and lightweight material. Speakers that are made of rubber deliver great sound but this material is more expensive than alternatives foam and cloth. Speakers made with foam or cloth are good performers too and are less expensive. So, if you are on a tight budget you can consider them. With this information, you can start comparing different component car speakers. Use the knowledge to select the speaker that will achieve the best sound quality when installed on your car. Your shopping will be easier if you work with a budget as the prices of these speakers vary widely. With that done, there’s absolutely nothing that will stop you from having the component car speakers that meet all your requirements.